2. The Sisterhood of Karn. This isn't the first time the Sisterhood of Karn have appeared on the show. They were part of an episode involving the Fourth Doctor, Tom Baker, in the '70s. Back then, they suspected the Doctor of wanting to steal the Elixir of Life on behalf of the Time Lords — the Sisterhood had previously used the Elixir to heal Time Lords who were experiencing trouble with their regenerations. 3. The Doctor can regenerate as a woman. There's been lots of speculation about the Doctor regenerating as a woman sometime soon. And "The Night of the Doctor" confirms the possibility. The Sisterhood of Karn says that being a woman is one of the options the Doctor can choose by drinking the elixirs they've prepared. 4. Responsibility. There's a sense of existential dread as the end of any Doctor approaches, a reminder that he too, someday, will die. But with the Eleventh there's even more dread about the other half of Sartre's existential equation: Responsibility. Even the Doctor has to make choices in the world — and his are particularly weighty ones. Entire races can live and die based on the Doctor's actions and he's forced to live that knowledge. In the season finale, he cried not just when he learned he was going to die, but when he learned that his secret — John Hurt — had been discovered. The Doctor has been trying to run away from the responsibility he bears for the decision he made during the Time War — even going as far as to hide an entire regeneration. He claims John Hurt doesn't even really count as "The Doctor". But now, for the first time, we see the first of the decisions which led to the genocide of the Time Lords and the Daleks. And the responsibility doesn't end with John Hurt. The Eighth Doctor makes a conscious decision to become the warrior he believes he needs to be. He chooses to turn his back on all that has defined him as "The Doctor." 5. The audio plays. McGann did more than just appear in the American movie. The Eighth Doctor was also featured in a bunch of audio plays. They've never been mentioned on the television show before, but those are his audio play companions who get mentioned just before the Doctor takes a sip from the chalice. 6. "Physician, health thyself." Just before he drinks, the Doctor quotes from the Bible, Luke 4:23. That's when Jesus goes back to his hometown, Nazareth. They all want him to perform miracles, like he has in other places, but he explains that it doesn't work that way. I know what you're going to say, he tells them, that old proverb "Physician, heal thyself," but prophets can't help their own people. "And they rose up and drove him out of the town and brought him to the brow of the hill on which their town was built, so that they could throw him down the cliff. But passing through their midst, he went away." 7. The bandolier. We see the Eighth Doctor take the bandolier from Cass after her ship crashes and she's killed. John Hurt was wearing it when we saw him for the very time in the season finale. 8. John Hurt looks young. Apparently, they used archival footage of John Hurt for this mini episode; we only see his reflection and it's very young. The Time War must have aged him terribly. 9. "The War Doctor." 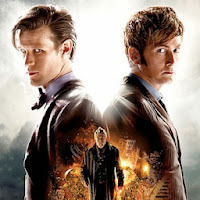 The end of the season finale was a bit confusing, with Matt Smith claiming that the John Hurt character didn't really count as "The Doctor" just before the title card declared "Introducing John Hurt as The Doctor." The credits of this mini episode seem to split the difference, calling John Hurt's character "The War Doctor." Read our recaps of the last season of Doctor Who beginning with the most recent: Doctor Who & The Other Doctors.